MultitrackStudio is a virtual multitrack studio. You can record and play audio and MIDI tracks, edit them, and mixdown to stereo. The straightforward and uncluttered user-interface has been designed with tape-based recording in mind. Mixer sections are oriented horizontally (as opposed to the more familiar vertical layout), allowing them to include an editor as well. The editing tools are aimed at correcting mistakes. MIDI tracks have been made to look like audio tracks as much as possible. The large number of high quality effects and the built-in General MIDI compatible MultitrackStudio Instruments make it possible to do software-only mixing and mastering. All track, mixer and effect settings can be stored in a song file and recalled any time. Using a songlist you can play a sequence of songs. This way you can preview your CD project without having to mix the individual songs down to stereo files first. MultitrackStudio features a context-sensitive help system: pressing the F1 key (Windows) / Shift-Command-? (Mac) will show help on the item the mouse points to. 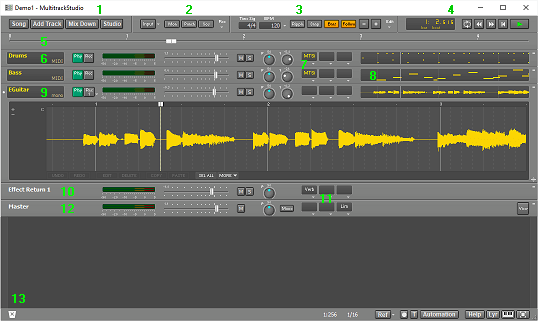 Tracks (6,9) contain audio or MIDI files. Tracks can be switched to playback or record mode using their Play and Rec buttons. Clicking the transport's Start/Stop button (4) will start recording / playing back all tracks simultaneously. Effects can be loaded in effect slots (11) by clicking the slot's down arrow. MIDI Instruments can be loaded in MIDI Instrument slots (7) in the same way. Tracks and effects etc. can be removed by dragging and dropping them onto the Garbage Bin (13). The complete setup can be saved as a song using the Song menu (1). The Mix Down menu's 'Mix down to audio file' option can be used to mix the song down to a single audio file.